“Let me also remind political parties and candidates that the end of primaries does not mean the immediate commencement of campaigns. Section 99(1) prohibits campaigns by political parties earlier than 90 days before polling day,” he said. Noting the commission has communicated these dates to all political parties, the chairman reiterated there will be no extension of time. 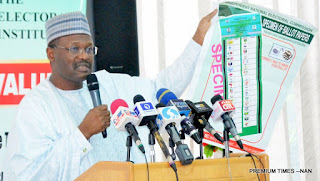 In making the submissions to the commission, Mr Yakubu said covering letters as well as the list of candidates must be duly signed by the national chairmen and national secretaries of political patties in line with the commission’s guidelines. The workshop themed “Strengthening Electoral Democracy in the Commonwealth African Region” is the second of its kind. The maiden edition was hosted by the Republic of Botswana in 2015. Appreciating the commonwealth for the choice of Nigeria to host this workshop, INEC said it is an indication that the Commonwealth is taking notice of the progressive improvement in the electoral process. Mr Mahmood said this is significant because today all the countries of the Commonwealth Africa Region are democracies conducting periodic elections, but need to further consolidate on the process so that elections are not merely periodic but also peaceful and credible.